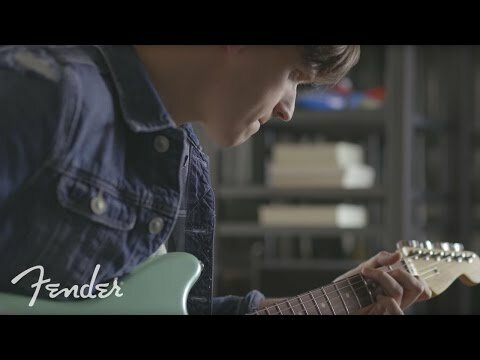 Since its initial release in the 1950s, Fender have produced a wide range of Offset series models, and now they are introducing the Duo Sonic HS Pau Ferro model. This modern take on this classic Fender guitar still retains the short-scale, compact build but includes some new and exciting appointments that make it so enjoyable to play. One of the most recognisable features of the Duo Sonic guitar is its short-scale size. The guitar's size contributes to an overall comfortable feel against the body, whether the player is small or perhaps you just love throwing the guitar enthusiastically about your body onstage. Like many of Fender's electric guitars, the body is constructed from alder and then treated with a gloss polyester finish for additional protection to the colour. Fender have firmly fitted a smooth maple neck to the body of this Duo Sonic guitar. The neck has a "C" profile for a comfortable playing feel in your hand. Further facilitating playability is the neck's satin polyurethane finish, giving it a slick, smooth texture. Aboard the neck is a pau ferro fingerboard with a 9.5-inch radius, offering you a total of 22 medium jumbo frets. Aged white dot inlays mark the frets to guide you from one to the next for a confident transition as you play. Fender have equipped this modern guitar with a vintage specification Duo Sonic Humbucker in the bridge position joined by a Duo Sonic Single-Coil pickup in the neck position. This pickup combination opens a whole universe of versatile tones and styles. To help shape your desired tone, Fender have included Master Volume and Master Tone controls joined by a wonderful Push/Pull coil feature. There is also the 3-way toggle pickup switch enabling you to alternate between pickups until you achieve the ideal sound, regardless of your preferred playing style. A 6-saddle strings-through-body Strat hardtail bridge with bent steel saddles is fitted to the lower bout of the body, providing reliable tuning in collaboration with the strings and Fender Standard Cast/Sealed tuning machines at the headstock. This bridge also really helps contribute to the guitar's range of tones, even if you need to cut through a band mix. A 3-ply mint green pickguard acts as a companion for the body, protecting against scratches while also complementing the finish. The Fender Duo Sonic HS Pau Ferro Electric Guitar is designed to entertain guitarists of all kinds, with a blend of old and new Fender appointments to keep it fresh and relevant, while undoubtedly looking and sounding fantastic.